Asbestos Rope : Asbestos Rope, Asbestos Rope Manufacturers, Asbestos Rope exporter, Asbestos Cloth, Asbestos Cloth Manufacturers. Twisted Asbestos Ropes: Several ends of sbestos yarns are uniformly twisted to produce very flexible ropes. 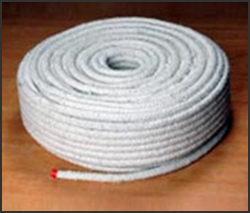 Caulking Asbestos Ropes: A number of soft packings with various construction parameters to produce caulking ropes. For thermal insulation of pipelines, particularly when there is a danger of damage by abrasion in very confined spaces and additional protective cladding is not used. These asbestos ropes are widely used in coke oven doors, between the fire bricks and steel frame-work in steel plants as well as in boiler houses. These asbestos ropes satisfy the need for a resilient yet tough material to accommodate differences in thermal expansion and effect an efficient seal against leakage of gases. Asbestos Rope is available in Packing: 1 Kg. / 2.5 Kgs. / 5 Kgs. / 7.5 Kgs. / 25 Kgs. / 50 Kgs.